Hello everyone…or should I say “Top O’ the Mornin” to you? St. Patrick’s Day is coming up, and I’m seeing green! 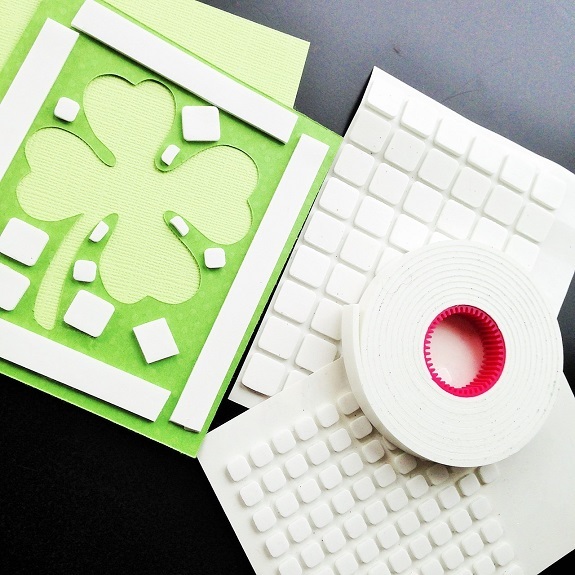 I created this dimensional Lucky card with lots of Foam Products. After I cut out my shamrock shape with my Brother ScanNCut machine, I matted it onto another piece of green cardstock using my Crafty Foam Tape and 3D Foam Squares. 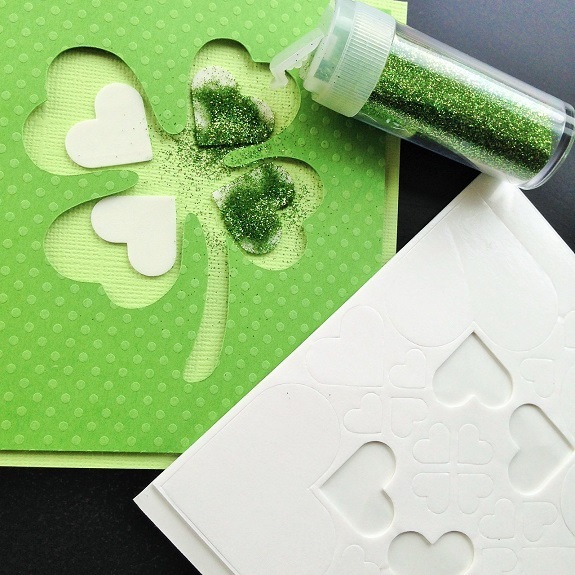 I placed 4 medium sized 3D Foam Hearts into each of the shamrock leaves and added green glitter. I love the sparkle! 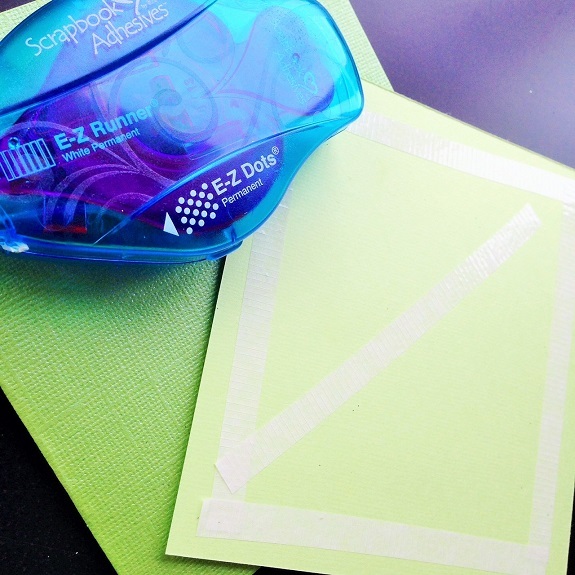 Then I used my E-Z Runner™ Permanents Strips to adhere this layer to my card base. The dispensers are interchangeable, so I put a red E-Z Runner™ Permanent Strips into my blue E-Z Dots™ Permanent dispenser. I also cut out the “Lucky” sentiment with my ScanNCut and used the small 3D Foam Squares to pop it up. Add a bit of twine, and the card is done! With my leftovers, I quickly made another card. Now I just have to figure out who is lucky enough to receive these cards! May all your rainbows have a pot of gold! Happy St. Patrick’s Day! This entry was posted in 3D Foam Shapes, 3D Foam Squares, Adhesives, Cards, Crafty Foam Tape, E-Z Runner® Dispensers, Seasonal Craft Ideas, Spring, Tutorial, Wear your Adhesive on the Outside and tagged 3D Foam Hearts, 3D Foam Squares Mix White, Bazzill Basics Paper, Brother ScanNCut, Card, Crafty Foam Tape White, E-Z Dots Permanent Refillable, St Patrick's Day. Bookmark the permalink. 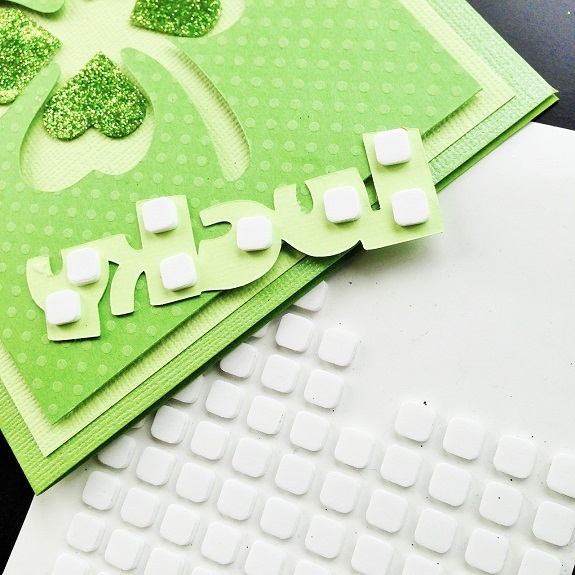 One Response to "Lucky Shamrock Card Tutorial"
Saw this on Kelly’s blog and LOVED it! !